← CAN SHE SOLVE A MURDER WHILE KEEPING ONE STEP AHEAD OF HER STALKER? Christina Holt has written two YA paranormal novels Second Chance and Vanished for Lachesis Publishing – both books have an element of mystery to them. It’s understandable since she is an avid fan of mystery novels. Well, who doesn’t love a good whodunnit? But Christina has gone one step further in her quest to solve a good mystery . . .
One of my personal favorite genres to read would be mystery and suspense books. Especially when the story has unexpected turns and keeps you guessing up until the very end. I think most people feel a sense of personal victory when they are able to solve the ending (or figure out the bad guy), before it is actually revealed in the book. I think that is why I got so excited when my husband first introduced me to The Great Escape Room game. (If you haven’t heard of this, you should look it up online to see if there is one near you!). There are several locations in various cities, and each one has different rooms all with unique themes. The staff locks you into a room with a group of friends and you have one hour to solve a series of puzzles in order to unlock the room. They let groups of seven people in at a time, and you definitely want different personalities in your group. The time I went, it worked out really well, because we had different types of people, some that were very quiet but smart, some that were always looking for all the details everywhere, some that were leaders, some just following directions. The next one we are doing is called The Mayflower, and it’s about a serial killer who has been nicknamed The Mayflower because of the ship in a bottle token he leaves by his victims. The discription says that the killer messed up and left evidence which leads to his apartment, which is where the game starts. It really feels like walking through a mystery novel and you and the people in the room are the characters in the book. Our Deal of the Week is the YA Paranormal VANISHED by CHRISTINA HOLT. ONLY .99 cents! Right here at Lachesis Publishing. Click on this link to purchase. Award winning author Christina Holt has written two YA paranormals for Lachesis Publishing: Second Chance and Vanished. Her books delve into the supernatural world but are very grounded in what kids and teens experience growing up. 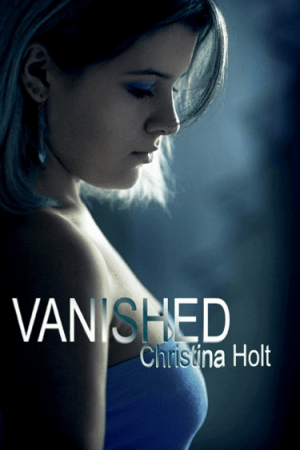 Christina recently won the Darrell Award award for her YA, Vanished. Connect with Christina on her website and on facebook and twitter.